LATHAM, NY -- Penfield resident Monique Foster, a veteran of the Iraq War, has been promoted to Lieutenant Colonel in the New York Army National Guard. 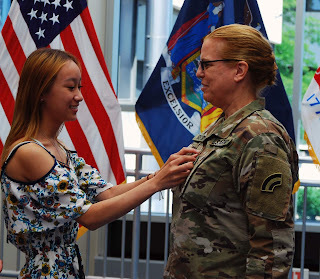 Foster, who serves as the provost marshal for the 42nd Infantry Division--the officer who coordinates military police operations--and also works as the Sexual Harassment Assault Response Coordinator and Equal Employment Manager at New York National Guard headquarters here, was promoted during a July 9 ceremony. Foster has served in the New York Army National Guard since 2003 when she was commissioned as a lieutenant in the 105th Military Police Company. She previously served as the executive officer to Major General Anthony German, the Adjutant General of New York and commander of the New York National Guard. During the promotion ceremony, German praised Foster for her dedication and drive. "The great thing about Monique is that she is a bulldog," German said. The first time he met Foster she was a military police company commander responding to a natural disaster in Hartford, N.Y., German said. "People kept telling me that whoever the captain was that was working with the Army National Guard was doing an excellent job," he recalled. Before joining the Army National Guard, Foster served as a commissioned officer in the United States Coast Guard after graduating from the Coast Guard Academy in New London, Connecticut. She served as a ships navigator and operations officer while conducting aid to navigation missions on the Great Lakes and drug interdiction patrols in the Caribbean. She was the first woman to be stationed at a navigation station on Attu, Island Alaska. She completed her duty in the Coast Guard as a marine inspector in Seattle, Washington. Following her Coast Guard duty she served as deputy sheriff in Portland, Oregon, before returning to her hometown of Rochester in 2002. As an Army National Guard officer, Foster deployed to Iraq with the 240th Military Police Company of the Puerto Rico National Guard as executive officer in 2006. She has served as commander of the 222nd MP Company in Rochester, the 27th Brigade Rear Detachment Logistics Officer, the 42nd Division production planner, and as operations officer and executive officer for the 104th Military Police Battalion. In civilian life, Foster has worked as a corporate security materials manager. Her awards include the Bronze Star Medal, the Meritorious Service Medal, the Iraq Campaign Medal, the Army Achievement and Army Commendation medals, the Coast Guard Achievement Medal, and the German Armed Forces Badge for Military Proficiency. Foster has two adult daughters, Mail Lynn, who is a graduate of SUNY Brockport and working towards a Masters Degree in Psychology, and Mika, who attends Roberts Wesleyan College.